The emergence of Beornings as an archetype in the Ered Mithrin cycle has been a cause for celebration around the hall. Seeing my clan represented in this game is something I’ve been clamoring for since the Core Set. 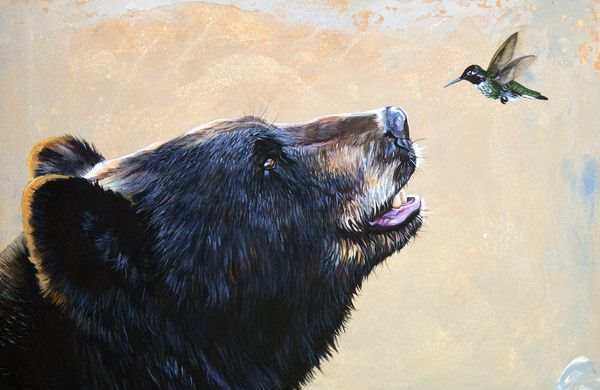 Ally Beorn has always been a powerhouse, but there was never a deck built around Beornings as a whole because there were too few of them around which to form any consistent strategy. Thanks to Beorning Skin-changer, the first inklings of a cohesive deck concept are coalescing. Eagle decks have long been a fascination of mine, and since there are not yet enough Beorning allies to support an entire deck, I’ve designed a deck with Beornings and Eagles, working together to rid Rhovanion of the scourge of ravening Wargs and ferocious Orcs. 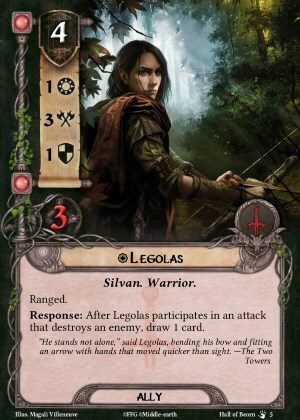 At its heart, this deck uses Raiment of War, Captain of Gondor and Support of the Eagles to transform Grimbeorn the Old into a one-bear killing machine. Éowyn and Mablung provide support, namely with questing and resource acceleration. Supplementing these heroes is a host of Eagle allies. The deck is light on attachments, but what is has is designed to empower Grimbeorn, or muster high-cost allies. Raiment of War and Captain of Gondor are both particularly effective with the son of Beorn. The bonus attack and defense are both used in concert with his ability. The additional hit points are always welcome on your primary defender. Legolas, the son of Thranduil, is visiting from his home in Mirkwood. His response ability is often essential in a mono-Tactics deck which can struggle with card draw. Foe-hammer is also included for this purpose, but requires Raiment of War to be attached and so is less reliable. Between these two cards, and pseudo-draw options like The Eagles are Coming and Open the Armory, the deck is fairly consistent. Along with Vassal of the Windlord, he also contributes ranged attack which can be a life-saver in multiplayer games. This deck has less ranged than I would normally build into a mono-Tactics deck, because Grimbeorn’s sentinel and counter-attack ability means that we can provide protection to less combat savvy decks without actually having the ranged keyword. The deck is rounded out with several powerful events. The low-cost events provide card draw, resource acceleration and stat boosts. The more expensive events are for combat control. 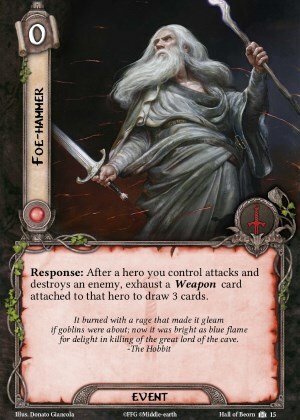 Oath of Eorl is a new favorite in my Tactics-heavy builds, especially in decks which feature Tactics Éowyn. Wait until the turn when you use her once per game ability, then you have a 10 strength chingona who attacks before the enemies even know what it happening. I’ve had a chance to play this deck several times in our local Austin Lord of the Rings group and it has performed admirably. Once you have Grimbeorn loaded up with at least one attachment he is a formidable hero. He takes after his father, in that regard. I hope that you enjoy this deck as much as I do; the full deck list is available on RingsDB. It was an enjoyable process finding alternate art images for these cards. Anyone who wants printable copies can contact us. From everyone here at the Hall of Beorn, have joyous and safe holidays! This entry was posted in Alternate-Art, Beornings, Deck Lists, Fun, Lord of the Rings, RingsDB, Theme and tagged Alternate-Art, Beornings, Deck List, Eagles, Fantasy Flight Games, Lord of the Rings LCG, Mono-Tactics, Raiment of War, Support of the Eagles, Tolkien. Bookmark the permalink.